Our grandson Alex hates vegetables and above all, he detests salads! This is the one salad that he is crazy about. 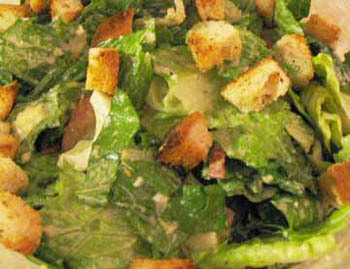 The croutons and bacon can be made ahead of time but the final preparation should be delayed until just before serving. Trim the crusts off four thick slices of white bread and generously butter the bread on both sides. Sprinkle with 1/4 tsp (1.25ml) garlic powder (unsalted). Cut into 1/2″ (1cm) cubes and bake on a cookie sheet for 10 – 15 minutes until golden brown, stirring occasionally. Take five rashers of extremely lean bacon (I prefer to use a ham type bacon product) and cut into thin strips approximately 1″ long (2.5 cm). Fry in a little oil to the desired crispness. Prepare croutons and bacon pieces as directed above, set aside. Combine garlic cloves, olive oil, Worcestershire sauce, salt, mustard powder, black pepper and lemon juice in a small bowl. Tear lettuce into bite-sized pieces in a large bowl. Toss with the garlic/lemon juice mixture. Mix in the bacon pieces and mayonnaise and then the Parmesan cheese and chopped eggs. An incredibly easy barbecue treat, be sure to marinate for two hours for best results! Cut beef into 1½” (3 cm) cubes and thread onto bamboo skewers, alternating each chunk of beef with a piece of red pepper or a slice of onion. Place completed skewers in a large casserole and cover with the marinade mixture. Allow to sit for two hours, refrigerate if leaving for a longer time. Barbecue over medium heat until meat reaches desired doneness, turning frequently. Baste with left-over marinade while cooking. 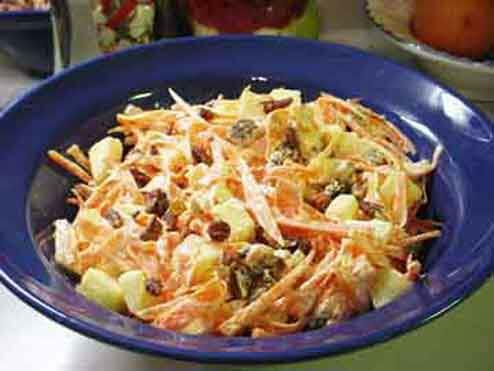 Carrot salad with apples and pecans is a delightful salad for Summer that will appeal to the whole family! Serve with Quiche for an ideal meal on a hot day. Place all the ingredients in a large bowl in sequence, being sure to add and toss in the lemon juice immediately after the apple to prevent apple chunks from oxidizing. 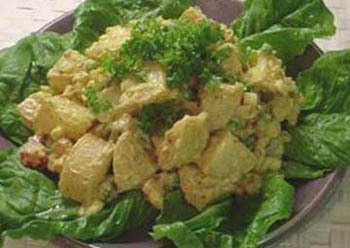 Curried Potato Salad is wonderfully cooling, but with that tang of curry. Good with curries, and other meals or on its own as a light Summer lunch. Cut cooled potatoes into 1″ chunks and chill in a bowl in the refrigerator for at least one hour before proceeding. Add peas, onions, celery, garlic and tomato and mix. Add all other ingredients and mix carefully to avoid crushing the potatoes and tomato. Chill for several hours before serving on a bed of lettuce leaves. Trim with sprigs of coriander leaves. Sirloin beef medallions are quite a popular cut of beef and make an easy meal. The crispy Dijon-hazelnut coating in this recipe makes a nice change from the bacon-wrapped version sold by many stores. Chop hazelnuts and two slices of whole-wheat bread with parsley flakes in food processor or blender until finely ground. In a small bowl combine Dijon mustard and Worcestershire sauce. Transfer to board and allow to cool slightly. 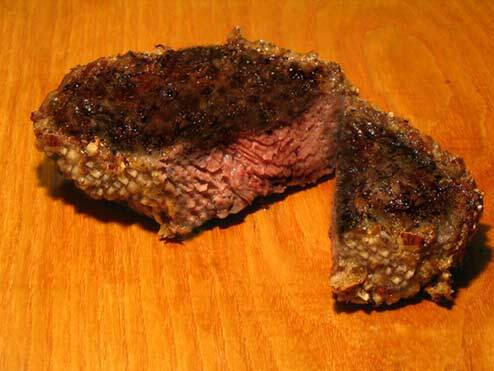 Coat sides of beef with Dijon-Worcestershire sauce mixture and then roll steak firmly in crumb mixture to form a crust. Lightly roll the crumbed surface in the oil remaining in the frying pan. Place steaks on a wire rack in a roasting dish. Bake for 25 – 30 minutes, turning once until crust is golden and meat is cooked to desired level. Reminiscent of Souvlaki, these barbecued chops have a wonderful oregano, garlic and lemon flavour. Place lemon juice, olive oil, garlic, black pepper and oregano in a plastic food storage bag and mix well. 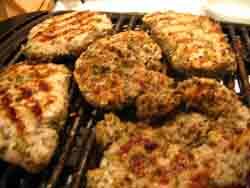 Use a sharp knife and make several small slits into the pork chops before adding them to the marinade mixture. 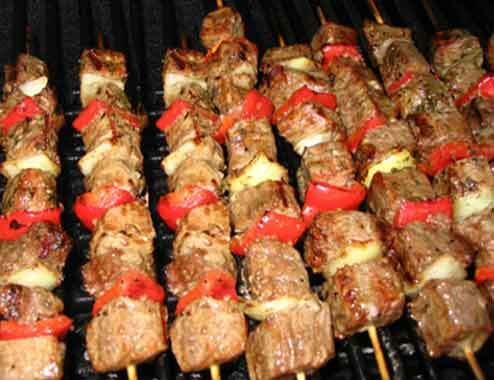 Barbecue or grill in the usual manner, using the marinade to brush on while cooking. 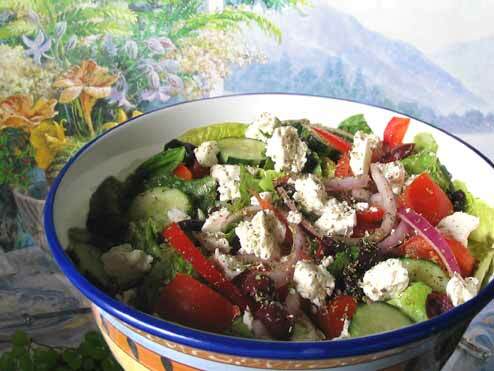 Greek salad is my favourite type of salad at this time of year! The quantities and ingredients can be varied according to what is in season, or what you have to hand; however I feel that you can’t omit the olives, feta cheese and oregano. Wash the romaine lettuce and tear into bite-sized pieces. Cut the tomatoes into rough chunks and add to the lettuce. Using a fork, score grooves into the cucumber lengthwise and then slice. Cut the red onion into half and then slice thinly, breaking the pieces up into individual curved strips. De-core the pepper and cut into strips. Remove the pits from the olives and scatter them over the mixed salad decoratively with crumbled chunks of feta cheese. Serve with a red wine vinaigrette, or your favourite dressing. My mother used to make this all the time when we were kids growing up in England, using fresh blackberries that we would pick by the bucketful. Happy days – although we used to get some fearsome scratches from the brambles! Mum used to have a saying,”When all fruit fails, welcome blackberry.” which goes to show how under-appreciated this great fruit was because of the sheer quantity of it that was available. When we lived in Kent, we found an abandoned market garden that had a huge and overgrown blackberry plot that provided us with bushels of fruit. Mum would make jams, jellies, pies and of course blackberry cobbler; it was almost with relief that late autumn would bring an end to the season and our scratches would finally heal for another year. In fact it was considered wrong to pick blackberries after Michaelmas (September 29) as folklore has it that Satan fell into a bramble bush when he was expelled from heaven and cursed the fruit from this date onwards! Unfortunately fresh blackberries are relatively expensive to buy in Canada but you can use frozen ones and still get excellent results (hopefully they were picked before Michaelmas!). A great old-fashioned dessert, especially in summer, served with ice cream. Beat in the egg, followed by the milk. Gradually beat in the flour mixture, being sure to scrape the sides of the bowl to get an even mixture. Place the blackberries in a 1½ quart (1 – 1½ litre) casserole greased with butter. Mix the cornstarch into the cooled jam syrup till smooth, and pour over the berries. Use a tablespoon to ‘dollop’ the batter onto the berries and syrup. Bake for 40 to 50 minutes until a toothpick inserted into the topping comes out clean. This is a very popular British dessert that is hardly known in the rest of the world. It is super-decadent, and yet is so fabulously delicious that it’s worth spoiling yourself once in a while! The name comes from ‘banana – toffee’. There are several versions of this recipe on the internet, and after exhaustive comparisons of recipes we settled on this as our family recipe. Combine the melted butter and Graham crumbs and press into an 8½” (21 cm) springform pan with a disk of parchment paper lining the bottom. Place in the refrigerator for about 20 minutes. In a medium saucepan, melt the butter and stir in the brown sugar until combined. Add the condensed milk and gently bring to a low boil, stirring constantly. Simmer gently, stirring continuously until the mixture starts to thicken and caramelize. Pour into the crust and spread evenly. Slice the bananas and place evenly on the caramel layer. 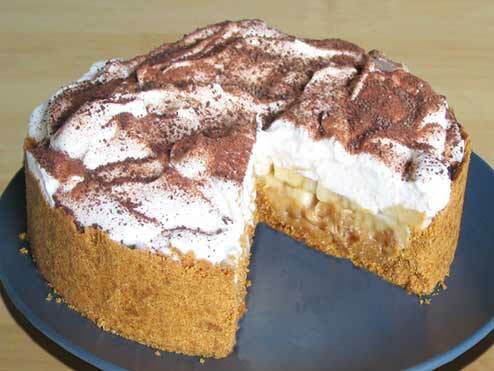 Add the cream over the bananas and trim with shards of grated chocolate. Refrigerate for a further hour before removing the sides from the pan and serving. Put pears, brown sugar, and vanilla seeds into a saucepan with water and simmer for five minutes. 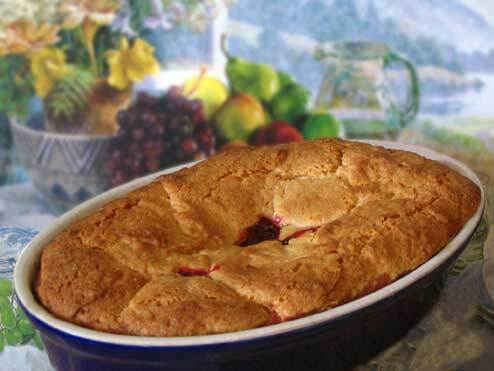 Place fruit mixture into a well greased ovenproof casserole. Beat together the butter and the white sugar, then beat in the eggs until the mixture is light and fluffy. Then beat in the flour until well combined. Pour this mixture over the pears and bake for about 35 – 45 minutes. 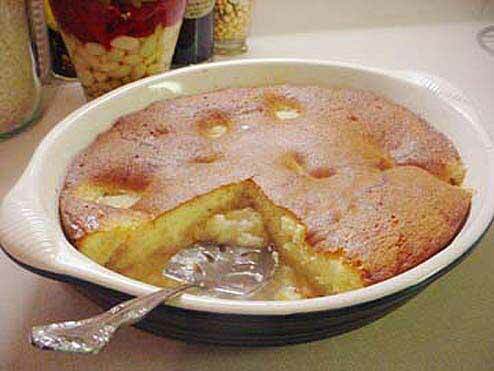 Serve the baked pear pudding with English Custard.